Cet article interroge l’actualité intellectuelle et légale des communs. Plus précisément, notre travail explore la notion de commun numérique (ou informationnel) et ses spécificités au regard du concept classique de communs en théorie économique. Les communs numériques désignent les nouveaux modes d’administration d’une ressource informationnelle par une communauté, qui sont permis par les technologies de l’information et de la communication. Ils constituent un mode de partage de ressources socialement valorisées. Les économistes s’accordent sur une conception classique des biens communs, désignant une ressource rivale et non-exclusive. Les communs numériques étant immatériels, cette définition est insatisfaisante. En outre, les travaux d’Elinor Ostrom ont souligné la dualité des communs, à la fois ressource exploitée en commun et régime de droits de propriété dérogeant au paradigme de la propriété privée. Notre article spécifie ainsi cette ambivalence à l’ère numérique. L’examen attentif d’exemples de communs numériques promus par l’Etat permet d’expliciter la logique contributive à l’oeuvre dans ces communs. Nous soutenons que cette logique autorise une nouvelle forme d’action publique. Alliée à la « multitude », en promouvant et en encadrant les communs, la puissance publique pourrait s’armer contre l’hégémonie croissante de grandes plateformes monopolistiques, dont les logiques s’opposent de plus en plus à celles des Etats. This paper addresses the current intellectual and legal status of the commons. Specifically, we explore the notion of the digital (or information) commons and its specificities with regard to the classic concept of the commons in economic theory. The digital commons concerns new ways of administering an information resource by a community, made possible by information and communications technology. It constitutes a means of sharing socially valued resources. Economists agree on a classic conception of common goods, designating a rival and non-exclusive resource. Because the digital commons is immaterial, this definition is unsatisfactory. In addition, the work of Elinor Ostrom emphasizes the duality of the commons: both a resource used in common and a property-rights regime running counter to the paradigm of private property. Our paper thus examines this ambiguity in the digital age. Careful study of examples of digital commons promoted by the state can clarify the contributory logic at work in these commons. We argue that this approach authorizes a new form of public action. Allied with the “multitude”, the public authorities could, by nurturing and supervising the commons, arm themselves against the growing hegemony of big monopolistic platforms, whose logic is increasingly opposed to that of the state. The Chichilnisky criterion is an explicit social welfare function that satisfies compelling conditions of intergenerational equity. However, it is time inconsistent and has no optimal solution in the Ramsey model. By investigating stationary Markov equilibria in the game that generations with Chichilnisky preferences play, this paper shows how nevertheless this criterion can be practically implemented in the Ramsey model, leading to attractive consequences. The time-discounted utilitarian optimum is the unique equilibrium path with a high-productive initial stock, implying that the weight on the infinite future in the Chichilnisky criterion plays no role. However, this part of the Chichilnisky criterion may lead to more stock conservation than the timediscounted utilitarian optimum with a low-productive initial stock. Based on the notion of von Neumann-Morgenstern abstract stability, we obtain uniqueness by assuming that each generation coordinates on an almost best equilibrium and takes into account that future generations will do as well. In open pit mining, one must dig a pit, that is, excavate the upper layers of ground before reaching the ore. The walls of the pit must satisfy some mechanical constraints, in order not to collapse. The question then arises how to mine the ore optimally, that is, how to find the optimal pit. We set up the problem in a continuous (as opposed to discrete) framework, and we show, under weak assumptions, the existence of an optimum pit. For this, we formulate an optimal transportation problem, where the criterion is lower semi-continuous and is allowed to take the value +∞. 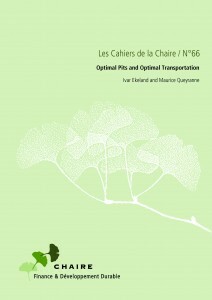 We show that this transportation problem is a strong dual to the optimum pit problem, and also yields optimality (complementarity slackness) conditions. This project aims to examine recent developments in commodity derivatives markets. The changed industrial organization and the financialization of these markets are major phenomena, both of which call for changes in regulation. Organized from March to November 2015, the thematic semester will include an opening conference, a series of thematic seminars, a summer school and a closing conference. We introduce a new class of nonlinear Stochastic Differential Equations in the sense of McKean, related to non conservative nonlinear Partial Differential equations (PDEs). We discuss existence and uniqueness pathwise and in law under various assumptions. We propose an original interacting particle system for which we discuss the propagation of chaos. To this system, we associate a random function which is proved to converge to a solution of a regularized version of PDE. 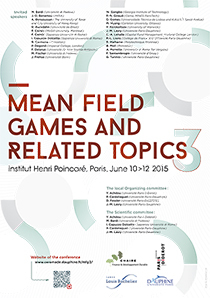 Mean field games theory was initiated by J.-M. Lasry and P.-L. Lions since 2006 in order to describe control processes with large number of agents (say, a population of identical individuals) whose strategy is influenced by the overall distribution of the agents. The macroscopic description, suggested as an asymptotic regime of Nash equilibria of N-players games when N goes to infinity, is given in terms of a new system of PDEs, where a backward Hamilton-Jacobi-Bellman equation (describing the individual strategy) is coupled with a forward Kolmogorov-Fokker-Planck equation (describing the evolution of the distribution law). 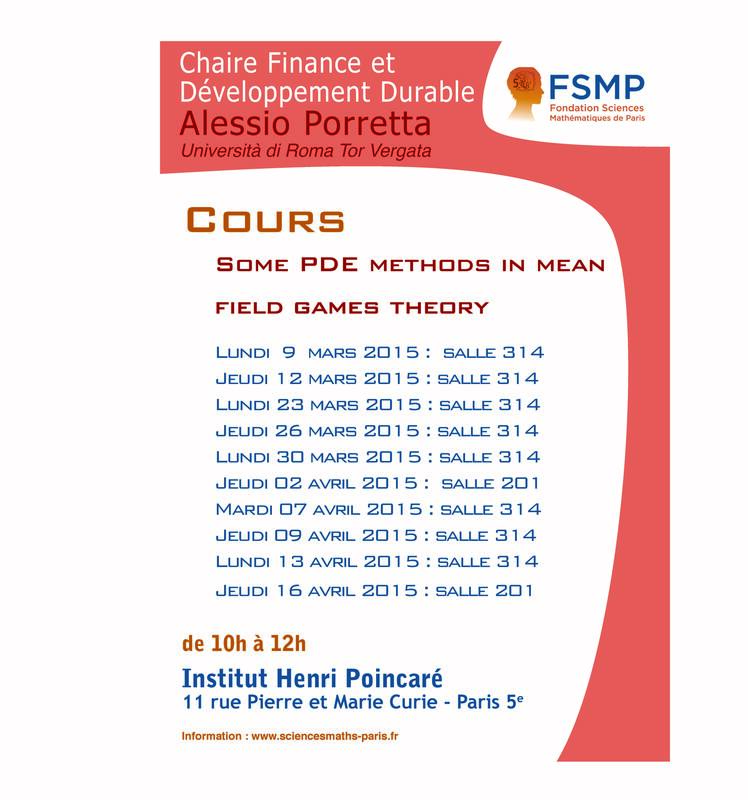 The goal of this course is to present several problems and methods recently developed in the study of those systems, addressing questions such as the long time behavior and its connection with the turnpike property of controlled systems, the optimal transport of the distribution law, the well-posedness of weak theories and other possible related directions of research. We apply the concepts of conditional entropy, information transfers and directed graphs to investigate empirically the propagation of price fluctuations across a futures term structure. We focus on price relationships for North American crude oil futures because this key market experienced several structural changes between 2000 and 2014: financialization (starting in 2003), infrastructure limitations (in 2008-2011) and regulatory changes (in 2012-2014) in addition to big demand and supply shocks in the underlying asset market. We find large variations over time in the amount of information shared by contracts with different maturities. Although on average short-dated contracts (up to 6 months) emit more information than backdated ones, a dynamic analysis reveals that, after 2012, similar amounts of information flow backward and forward along the futures maturity curve. The mutual information share increased substantially starting in 2004 but fell back sharply in 2012-2014. In the crude oil space, our findings point to a puzzling re-segmentation of the futures market by maturity in 2012-2014. More broadly, they have implications for the Samuelson effect and raise questions about the causes of market segmentation. 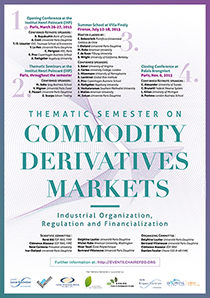 We examine the impact of two financial crises on commodity derivative markets: the subprime crisis and the bankruptcy of Lehman Brothers. These crises are “external” to the commodity markets because they occurred in the financial sphere. Still, because commodity markets are now highly integrated with each other and with other financial markets, such events could have had an impact. In order to fully comprehend this possible impact, we rely on tools inspired by the graph theory that allow for the study of large databases. We examine the daily price fluctuations recorded in 14 derivative markets from 2000 to 2009 in three dimensions: the observation time, the space dimension – the same underlying asset can be traded simultaneously in two different places – and the maturity of the transactions. We perform an event study in which we first focus on the efficiency of the price shock’s transmission to the commodity markets during the crises. Then we concentrate on whether the paths of shock transmission are modified. Finally, relying on the measure proposed by Bonacich (1987) for social networks, we focus on whether the centrality of the price system changes. We establish explicit socially optimal rules for an irreversible investment decision with time-to-build and uncertainty. Assuming a price sensitive demand function with a random intercept, we provide comparative statics and economic interpretations for three models of demand (arithmetic Brownian, geometric Brownian, and the Cox-Ingersoll-Ross). Committed capacity, that is, the installed capacity plus the investment in the pipeline, must never drop below the best predictor of future demand, minus two biases. The discounting bias takes into account the fact that investment is paid upfront for future use; the precautionary bias multiplies a type of risk aversion index by the local volatility. Relying on the analytical forms, we discuss in detail the economic effects. The willingness of households to pay for prevention against industrial risks can be revealed by real estate markets. By using very rich microdata, we study housing prices in the vicinity of hazardous industries near three important French cities. We show that the impact of hazardous plants on the housing values strongly differs among these three areas, even if the areas all surround chemical and petrochemical industries. We compare the results from both standard parametric and more flexible, semiparametric models of hedonic property. We show that the parametric model might structurally lead to important biases in the estimated value of the impact of hazardous plants on housing values and in the variations of this impact with respect to the distance from the plants. Les initiatives de comptabilité des émissions de carbone se sont multipliées au cours des dernières années, à mesure que la problématique du changement climatique s’est imposée. Pour chaque agent économique, la problématique climatique se traduit par des questions, des enjeux et des objectifs différents, si bien qu’une diversité de comptabilités carbones s’est développée. 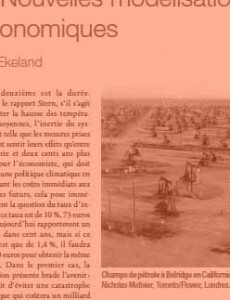 Cet article propose d’examiner ces modèles comptables : Inventaires Nationaux, comptes NAMEA, Bilan Carbone) à travers leurs règles d’allocation des émissions de gaz à effet de serre (GES) aux acteurs et activités économiques. L’article replace ainsi les règles techniques des comptabilités carbones dans la perspective du débat plus fondamental autour de la définition de la responsabilité des agents économiques. Enfin il définit un nouveau type d’allocation des émissions de (GES) aux activités économiques, fondé sur le concept de « responsabilité fondamentale » : la « comptabilité carbone par enjeux ». Ce nouveau type de comptabilité est appliqué à la cartographie des émissions de GES induites par un portefeuille bancaire. Insurance coverage for natural disasters remains low in many exposed areas. A limited supply of insurance is commonly identified as a primary causal factor in this low insurance coverage. The French overseas departments provide a rare natural experiment of a well-developed supply of natural disasters insurance in highly exposed regions. The French system of natural disasters insurance is underwritten and regulated by the French government; instituted initially for metropolitan France only, it was extended to overseas departments in the state of emergency following Hurricane Hugo in 1989. This natural experiment makes it possible to analyze the determinants of insurance coverage on the demand side. Based on unique household-level microdata, I estimate an insurance market model which had not yet been empirically tested. Using this structural approach, I show that underinsurance in the French overseas departments is neither due to perception biases nor to unaffordable insurance, but mainly to uninsurable housing and to the anticipation of assistance, which crowds out insurance. Individual insurance decisions are influenced by neighbors’ insurance choices through peer effects and neighborhood eligibility for assistance. Publié dans Agathe Euzen, Laurence Eymard, Françoise Gaill (dirs). Le développement durable à découvert. CNRS Editions. 2013. In economic theory, and in optimal control, it has been customary to discount future gains at a constant rate δ > 0 (…). That future gains should be discounted is well grounded in fact. On the one hand, humans prefer to enjoy goods sooner than later (and to suffer bads later than sooner), as every child-rearing parent knows. On the other hand, it is also a reflection of our own mortality: 10 years from now, I may simply no longer be around to enjoy whatever I have been promised. These are two good reasons why people are willing to pay a little bit extra to hasten the delivery date, or will require compensation for postponement, which is the essence of discounting. On the other hand, there is no reason why the discount rate should be constant, i.e. why the discount factor should be an exponential e−δt. L’objectif de cette conférence est de faire le point sur les travaux réalisés depuis 7 ans au sein de la Chaire et au sein des « Initiatives de recherche », projets de recherche parrainés par la Chaire et ciblés sur des sujets plus précis (assurance récolte, microstructure des marchés financiers, finance des marchés de l’énergie…). 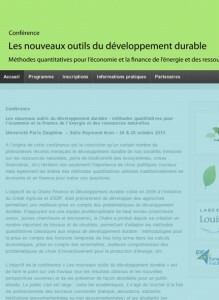 Autour de conférences invitées, six ateliers seront organisés sur 2 jours portant sur des méthodologies novatrices (jeux à champ moyen) ou des thèmes ciblés (les outils de la micro assurance pour les agriculteurs des pays en développement, la finance des marchés de l’énergie, etc). On alternera les présentations de chercheurs senior et les présentations de jeunes chercheurs. 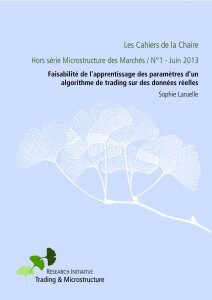 Considérons qu’un trader ou un algorithme de trading interagissant avec les marchés durant les enchères continues puisse être modélisé par une procédure itérative ajustant le prix auquel il poste ses ordres à un rythme donné, (Laruelle, Lehalle & Pagès, 2013) propose une procédure minimisant son coût d’exécution. Ils prouvent la convergence p.s. de l’algorithme sous des hypothèses sur la fonction de coût et donnent des critères pratiques sur les paramètres du modèle qui assurent que les conditions pour utiliser l’algorithme sont vérifiées (notamment, en utilisant un principe de co-monotonie fonctionnel). Ici on va estimer les paramètres du flux d’exécution d’ordres. Tout d’abord on fait une étude de stabilité des paramètres et ensuite on construit des algorithmes adaptatifs pour estimer ces paramètres “en-ligne”.